I didn’t just skulk around in cemeteries this past summer, researching family history. I didn’t just explore old buildings and try to unlock the stories they revealed. My father and I enjoyed some wonderful foods! There is nothing like produce purchased at the markets of the Quinte region…things coming into season and sold at a fantastic price. You have to love summer! 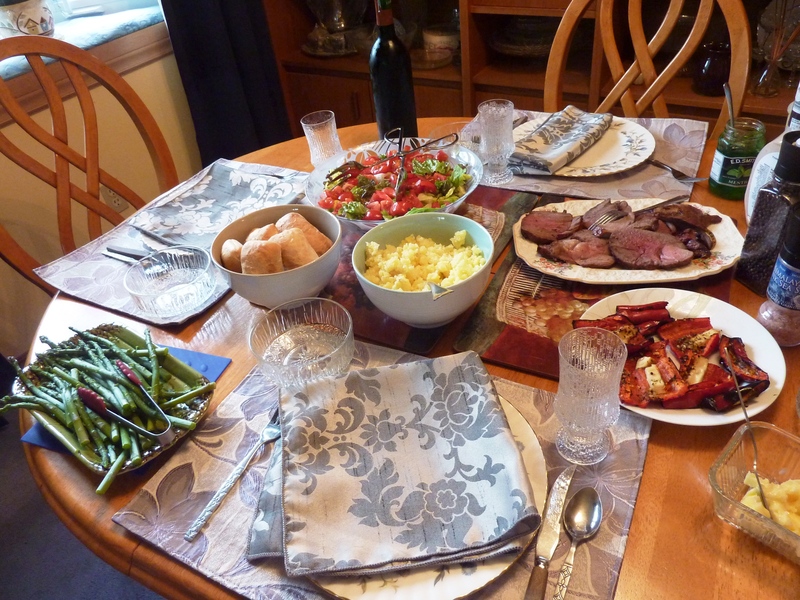 My father prepared all of my dinners for me, usually accompanied by his house red, and he is a marvelous chef! It was a joy to share meal times with my Dad. 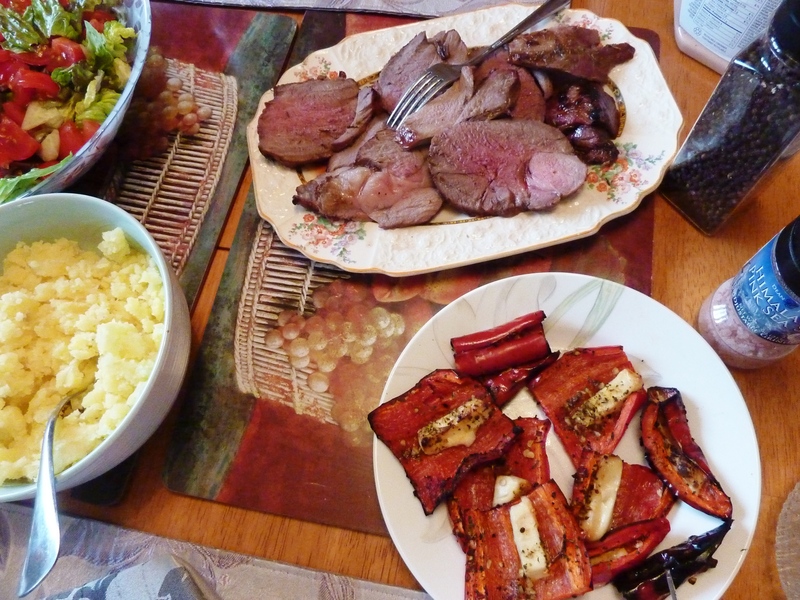 One evening, though, Morley and Barb had us over for a lamb barbecue. Not only were our hosts very gracious, but they served up for me, one of the most aesthetically beautiful meals of the summer. Dad and I were having a tough time with our grief and once Morley’s home made white came out and dinner was served, we were feeling the pleasures of support and friendship. Isn’t it true? Friendship makes all food taste better! I know…it’s the strangest thing that people these days are so preoccupied with taking photographs of their food. When my Mom prepared so many beautiful feasts, we didn’t collect photographs of her culinary delights. Not many photographs of meals have survived from the 50s, 60s, 70s, 80s or 90s. I know that once cookbooks began to include glossy photographs, people went nuts over cooking. 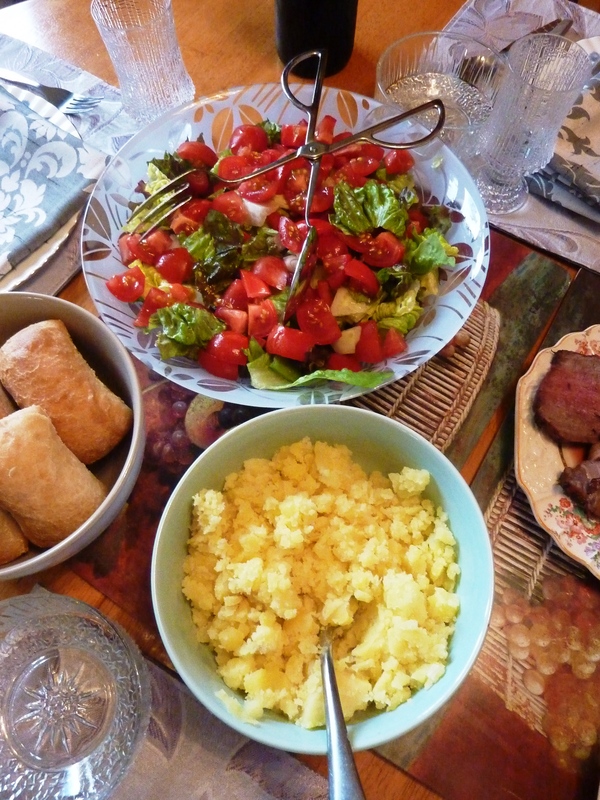 There is no record of what our mother’s/grandmother’s good food looked like as it was served. Does anyone have a photo of a meal from previous decades that they would like to share? I wonder what future generations will think of our vast portfolio of dinner plates. This meal simply cried out to be archived. Dad sent me this recipe via electronic mail if my readers wish to try the lamb. Then Dad got this recipe off the internet. Combine oil,thyme,basil,rosemary and garlic,lemon zest-salt & pepper in a bowl.Dip the lamb chops into mixture and coat evenly (I know Barb rubs it in the meat) cover the chops and refrigerate for at a minimum 30 minutes preheat the grill (oven). Grill about 5 minutes per side.Chops should be browned on both sides. 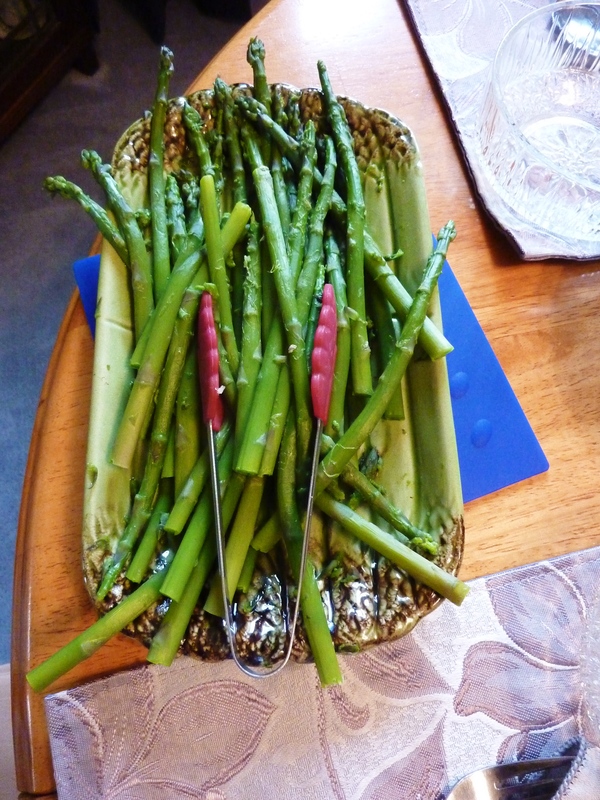 This entry was posted in Angels, Feasting, Magic, photography and tagged Asparagus, Belleville Market, food, Food Markets, Friendship, Front Street, Lamb, photography, Quinte Region, Taking Photographs of food by Painter Lady. Bookmark the permalink.